I make a brief appearance in the movie adaptation of Ender’s Game. I’m in the climatic scene toward the end. If you haven’t read the book or seen the movie stop reading now as I’m about to describe my scene. OK, so I’m in the final battle scene, when Ender takes on the Formic home world and victory for the human race suddenly seems impossible. We’re terribly outnumbered, and there’s no chance of us even reaching the planet much less destroying it. I play one of the officers of the International Fleet up in the observation room above Ender’s simulator watching him conduct his “final test.” I’m on the far left. If you’re not looking for me you’re not going to see me because your eye will very naturally go to the stars of the film in the observation room with me, namely Harrison Ford and Sir Ben Kingsley. They’re in the center of the shot where they belong, and I’m in at the fringes where I belong. Well, technically I don’t belong there at all since I’m not a actor, or at least not an actor deserving of a legitimate film role. But hey, I was offered the chance to do it, and you can bet your buttons I jumped on it. What’s cool about my costume is the brilliant costume designer for the film gave my character her last name. So I’m Captain Clark. Or maybe I’m a colonel. I don’t remember anyone ever telling me what my rank was, and maybe my uniform doesn’t indicate rank at all. 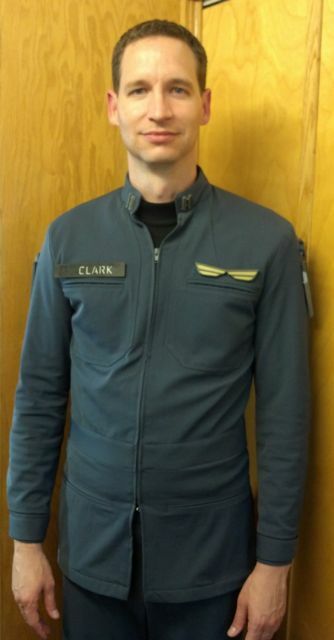 (The wings over my left breast might be rank insignia. Or there might be insignia on my arm. I don’t recall.) In any case, it was a blast. The hair department cut my hair short short short for the film, which was especially exciting because it required me to “report to hair and makeup.” I felt like a star. I wanted to ask a PA where my trailer was, but I’d probably only get a blank stare. The movie comes out on Blu-Ray on February 11, and I hope all of you plan on purchasing a copy. 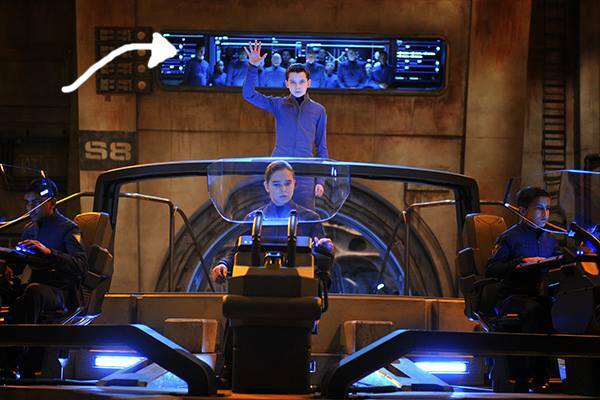 Because, hey, it’s Ender’s Game. Awesome! Growing up watching Star Wars, I never dreamed I would one day ride in a mini van with someone who would one day steal a scene from Han Solo.